By Kgothatso Mokoena, World YWCA Programme Associate. Kgothatso recently attended the consultation meeting on the High Level Panel 2015 held at the UN Headquarters in Geneva, Switzerland. Below she shares her experience. These reports will serves as the Secretary General’s input to the UN Secretary report to the September 2013 General assembly special event on the Millennium development Goal (MDG’s) and the Post -2015 Development agenda. It was thus an official platform for civil society to provide analysis of the findings of these reports and to propose alternative approaches. Questions : the participants raised questions about the heavy focus on private sector and how will the new development agenda be financed given the on-going global economic crisis . Another question was the criteria for resource allocation and implication for regions such as sub Saharan Africa, where 90% of poverty is anticipated, and who have limited access to global markets. The last was a concern about the increasing reliance of the UN on High Level Panel which don’t include CSO , making the inter-governmental processes out of reach for marginalised and excluded groups..
Civil societies were encouraged to strengthen their linkages between the Private Business sector and the development agenda, and though the various initiatives exist , to develop a coherent strategy for including all as the slogan for process is leave no one behind.. It was suggested there’s a urgent need for good innovative programmes which can influence PP partnerships contribute ahuman rights perspective to the post-2015 agenda. A specific intervention would be the strengthen and expand work being done , with a particular focus on social accountability and increasing opportunities of employment and investment for all citizens in economically unequal countries . Various questions were raised on how to combat climate change. It was also noted that social and environmental indicators were weak and there was no direct link to their implication for peace ,in countries where conflicts are driven by limited access to resources such as water and carbon fuels. The answer was there is commitment for capacity building of CSOs in these contexts to be more involved in linking peace building to sustainable development . There will be a conscious allocation of resources to an ecosystem based approach to disaster management and investment in local adaptation capacities to counter climate change and conflict driven by social exclusion from natural resources. • Investing in young women’s education and training particularly the over 15 million that are out of school and already married. • Measures to be taken to protect the economic and social rights of these young women , particularly rights to identity and property , without which they cannot vote , open a bank account or own land , this defeats the objective of the HLP Report of ensuring that no one goes hungry no more. • Climate change and environmental degradation has a profound impact on these young women as they are responsible for providing water and fuel for the household , and are often caught up in the conflict for natural resources , raped and abducted forced to be wives of combatants . • Efforts must be made to include their voices in any discussion on sustainable development, peace building and climate change. The UN Women paper advocating for a transformative stand-alone goal on gender equality, women ‘s rights and women’s empowerment was as key resource for the Post-2015 HLP report 2013, and provided critical content for the gender goal , which highlights the importance of ending child marriages , but in conclusion I believe that much still needs to be done before September, to include the needs and voices of all young women and particularly those who are already married or are in difficult circumstances and socially excluded at community level. • Youth development: employment, training and education opportunities. • Special attention to be given on Climate change and Justice Issues. 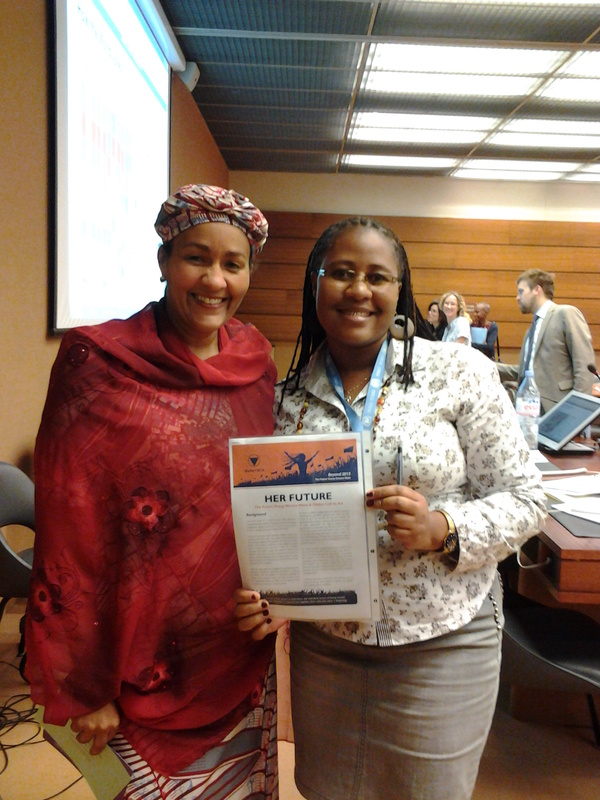 Copy of the “Future Young women wants” was then handed to Madam Amina J. Mohammed, special advisor of the Secretary- General on the Post-2015 development planning.